I am, first and foremost, an urban fantasy reader. On the secluded island that is my mind, a new series as good as The Others is more rare and more coveted than a fresh batch of blueberry muffins. And I do love my blueberry muffins. It should be mentioned that Written in Red leans more towards the fantasy part of urban fantasy. In fact, if we take the strictest definition, it’s not urban fantasy at all. But it’s a thin line, and Bishop’s world so unique that I see no point in making the distinction. In Written in Red, we familiarize ourselves with Thasia and its inhabitants. In Thasia, Others live in compounds where they govern themselves. Human laws don’t apply. Their contact with humans is extremely limited, which is for the best. Any human who breaks a law of the Others ends up eaten or worse. Humans (or monkeys, as the terra indigene call them) have access to a few stores and restaurants, but they aren’t allowed to go anywhere near the residential complexes where the Wolfguards, Hawkguards, Crowguards, Sanguinati and other clans live. The terra indigene are not human. They are supernatural creatures that acquired human skin because it suited them for some reason. If visitors to the courtyard expect them to react and behave like humans, they are most likely to get eaten. The Others don’t advertise the fact that they all eat special meat, but they don’t try too hard to hide it either. To them, humans are monkeys, and they only tolerate them because there are certain human inventions and products they enjoy. “But what would they have said to their Liaison? It’s like this, Meg. We didn’t like that Asia Crane, so we ate her. Meg Corbin, a blood prophet and the courtyard’s human liaison, is not your typical urban fantasy heroine. She is physically weak from being imprisoned all her life and her knowledge and social skills come from carefully selected photographs and video clips. Until she escaped, she wasn’t allowed to talk unless she was speaking a prophecy. But despite her obvious weaknesses, there is a certain strength in her quiet, persistent ways, a steel spine in her small, fragile body. And unlike all the other humans, she doesn’t smell like prey. The narrator’s voice has a very pleasant timbre and her voice characterization is excellent. Simon Wolfguard is a true alpha male if there ever was one (notice how I wrote male but not man! ), and getting his voice just right was no small feat, yet Harris gave him just the right amount of growl and menace without making it seem like she was trying too hard. 18 hours is a very long time to spend listening to a single person, but Harris made it very easy. In the future, I won’t hesitate to pick up any audiobook she narrated. I can’t believe I have to wait a whole year for Murder of Crows to come out. Just thinking about it is painful. But I do know I’ll wait for the audio, if they keep the same narrator. This is another book I can already add to my ‘Best of 2013’ list. 18 hours is a fair length for an audio book but a good narrator can make that seem short and it sounds like this one did! I've seen this cover around but this is the most detail I've read about the book and it sounds good! And here I was thinking that I couldn't find an audiobook to buy with my monthly audible.com credit. I'll def. be checking this one out now! I'm so glad you loved this one, I love the title, brings a whole new creepy level to it. Well written review, Maja! BLUEBERRY MUFFINS OF AWESOME! I can't believe we have to wait until next year, either. I LOVED this book and am dying for more. I LOVE finding new UF to read as well, it is rare that I fall in love with a new series because I am pretty picky if truth be told. I am so glad you really liked this one. I lean more towards the other spectrum of UF but I think I would like this one. OMG, Maja! Every review of this book I'm reading is literally taunting me! :) It sounds absolutely fabulous! I am firstly UF reader as well and it's not that easy to find UF series that I can rate as beyond average these days, but this one sound like one I'd love. Thank you! MMM Blueberry muffins that is the only thing I retained from reading this review. Other than that I am glad I got this book. Now I just need to read it! I'm reading the book currently and I really enjoy it so far. I like how the Others honor Meg as a member. Glad to learn that the audio version is impressive! I first heard about this one from Wendy so I'm happy that you enjoyed it too, Maja, especially as yours was the audio version. I normally don't listen to audio books because I find it hard to concentrate on what's happening but I'm impressed that the narrator was able to get the guy's voice to sound believable. Happy to see that the narrator was just as good as the story here! I have seen a few glowing reviews for this and even though it isn't my genre I am curious about it! It sounds like it has some top notch world building and that is always something that I am looking for. I don't seem to be getting it in YA lately so maybe I need to branch out into adult a bit more? ANywho, great review, Maja! I've heard nothing but amazing things about this book Maja! I gave it to my mother in law to review for the blog and she absolutely adored it. I think her favorite characters were the people who were crows - something about them constantly being distracted by shiny objects made her laugh:) 18 hours is definitely a long time to listen to one person, so I'm glad the narrator was brilliant! AH! Year waits are always killer when you want the next one now. The paranormal concept sounds interesting, and I am glad you enjoyed. I know visiting your blog is going to be dangerous for my TBR and wallet and yet I do it anyway.... :-) This book sounds exactly like my kind of read. The world seems fascinating, and I love a good alpha male. I'm currently catching up on Mercy Thompson on audio, but I think this will be my next listen after that. I love not only having a guarantee of a great story, but a great narrator—that's SO important to me. I listen to audiobooks when I run, so I need to be transported by the performance, because I hate the monotony of running. :-) Wonderful review, thanks for introducing me to this! This sounds so good and another book I may have to try on audio. Oh I do think I'll have to see if the library has a copy on an audio format I can use (I hate when they don't!). If not, I do think I'll have to add it to my tbr. It sounds fab (as well as a bit icky... "special meat"). Wonderful review, of course I now want blueberry muffins you naughty girl! I love urban fantasy and this world has me curious. Especially with the reversal of citizenship. Hmmm, I think I want to try this one. Amazing review. Thank you! HI MAJA!!! HOW ARE YOU? I'm back from my exam break and I've missed you and your blog so much. <3 Can't wait to get back to commenting on and reading your lovely posts again :D :') The Others seems so good and different, while I'm not really an Urban Fantasy reader like you, I do tend to like to challenge myself and read books outside of my comfort zone, so I'll definitely pick this up! It's so great that the voices made it a pleasant experience for you. Fabulous review, doll! <3 x Missed you! Whoops I commented under my other profile. :P LOL silly me! This sounds kind of awesome! I really need to check out an audiobook sometime soon; I've never listened to one. Glad this narrator worked though. I do want to check out more UF, even if this one is on the thin side of UF. Quite alright! I want to read this one SO bad! 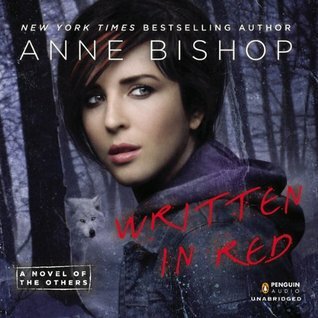 I love Anne Bishop! I like that it's more fantasy than urban, that's my preference, though I like both. I'm so tempted to buy this one right now! Wonderful review! I read Anne's Black Jewel series ... well, the first 2 or 3 book, anyway. It was very fantasy, which I'm not big on, but man, she can write. I'm really tempted to read this book. Ahhhhh! I have this sitting on my shelf from the library, but I'm not sure I have time to read it this week and it has to go back soon! But I love a well built fantasy world and this story sounds really fascinating. I do get nervous about beginning series so far from the release of the second book, so I may wait a while. But it is on my list for sure. And though I'll read the print, the fact that this narrator was able to achieve the male voice is a great feat! This one is completely new to me! You know, I don't read a ton of urban fantasy, but I would definitely read this. Or listen to it actually! Now see you went and made me regret not voting for this when it came up as a possible book club pick this month! I love that you found it to be such a great series start Maja, because yes, those are oh so rare. Bummed by library doesn't have it on audio, but I'll hopefully track it down or read it in print!